I have eaten at Chaulas before, I visited their Lewes restaurant a while ago now. I don’t remember exactly when, but I remember thoroughly enjoying it. So when I was invited along to their Brighton restaurant, I didn’t hesitate to accept. 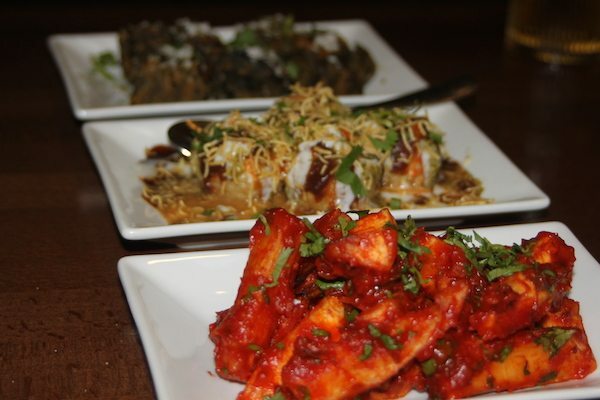 Tucked away off East Street, on Little East Street, Chaulas Brighton is smaller than its older sibling in Lewes. The very fact that this second restaurant exists goes some way to demonstrating Chaulas popularity. The story behind these restaurants is a charming one. 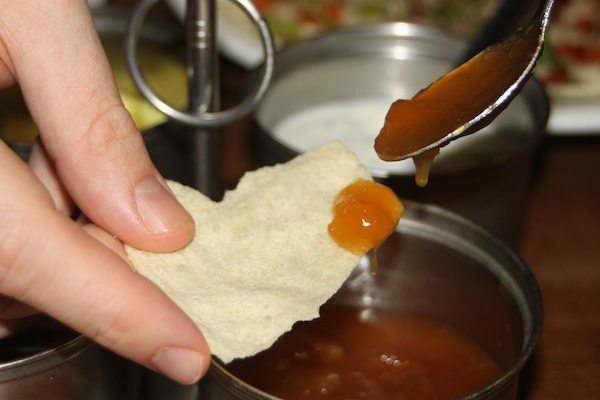 From selling home cooked food from their grocery shop in Lewes, continued success led to opening Chaulas Lewes in 2007 and then Chaulas Brighton in 2012. Greeted by a tuktuk and our smiley waiter – whose name we later learn is Yadab – Chaulas is instantly warm and inviting. 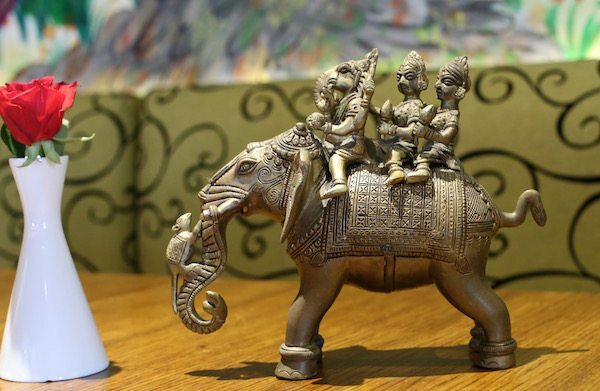 With décor distinctly personal, the array of colourful ornaments and paintings makes you feel you might be entering someone’s home, rather than a restaurant. I like it a lot, it feels genuine and seriously unpretentious. With so many restaurants going for the ‘less is more’ minimalist vibe, it’s nice to walk into somewhere with a bit of character. And what conjures up images of India more, than oodles of colour and lashings of gold. The restaurant is buzzing and busy tonight, despite it being a Tuesday. Once seated, I can’t help but notice the table next to us chattering away. Clearly impressed by their meal, conversation is centred on the vibrant array of curries and sides that they are tucking into. 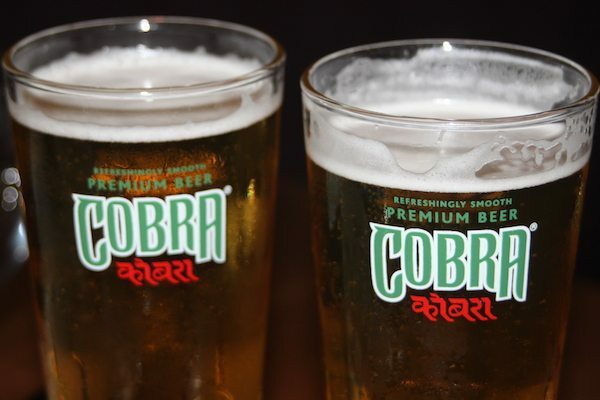 First we order two pints of Cobra beer and two Papadum from Yadab. Seriously attentive and full of helpful suggestions, Yadab is my favourite kind of waiter. 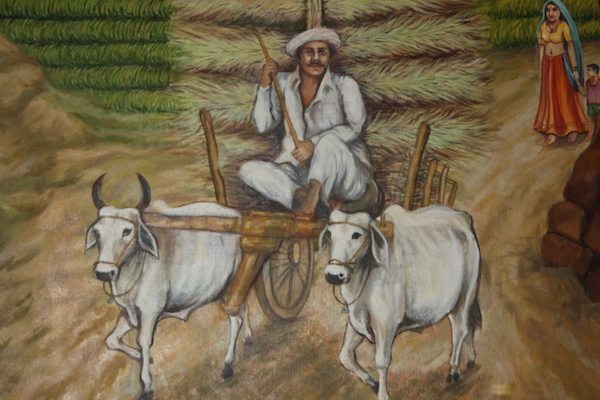 He is proud of the food served at Chaulas; he has his favourites; he is confident we will love the dishes he suggests; he describes the dishes clearly and knows his stuff. Our starters – all recommended – all intriguing. We can’t make a choice of two; Yadab persuades us to go with three. They are lovely to look at, all distinctly different, colourful and enticing. Every dish is new to us. 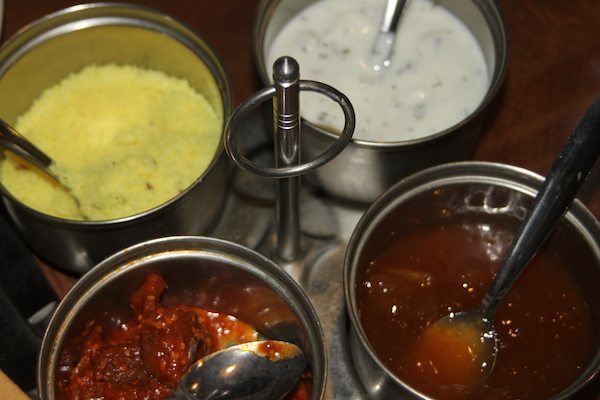 Every dish spiced differently, a myriad of flavours in each mouthful. The Dahi Puri (£4.75) – hollow puris filled with mildly spiced potatoes, chickpeas, coriander, red pepper, tamarind chutney and yoghurt – is served cold and is delightful. The cool yogurt and the sweet chutney is paired beautifully with the comforting flavour and texture of the potatoey balls. I can’t compliment this dish enough. I have a rivalling fondness for our other starters too. Chatpata Mogo (£3.99) – Fried cassava chips coated with Chaulas special marinade; an Indian – and frankly far tastier – version of chucky chips and homemade ketchup. Smothered in a vivid spicy red sauce, these are seriously filling but undoubtedly moreish. The wonderful Patra (£3.99) – leaves of edible colocasia or “elephant ear” plant coated with spicy batter rolled up and steamed to make delicious spiral snacks – rounds our veggie starter selection of perfectly. We consider it criminal to leave an iota – so we don’t! Yadab kindly offers us some resting time between courses. We are gushing about his starter suggestions and welcome our mains; we also welcome the opportunity to digest. Like our satisfied neighbours, we find ourselves chattering happily about the fantastic food until the arrival of our next course. 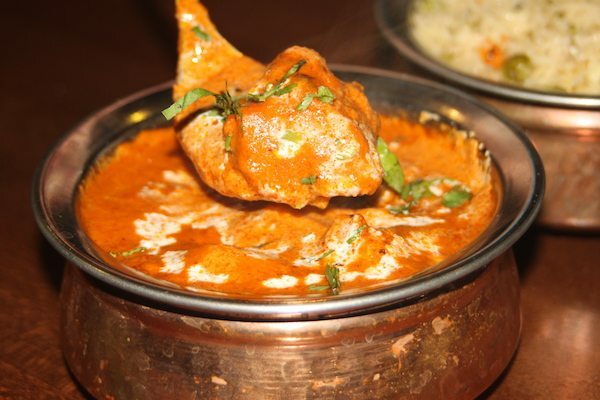 Another recommendation, my partner has gone for the Murg Makhani (£9.99) – a sauce of cashew nuts, ginger and garlic paste with added yoghurt and cream, served over generous pieces of chicken. 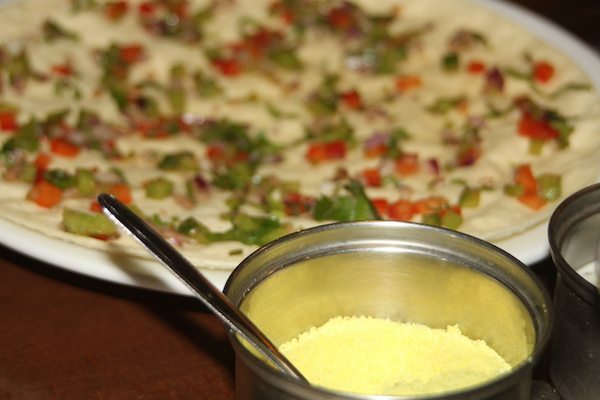 I initially flit between several of Chaulas wonderful sounding vegetarian offerings: Daal Palak, Mutter Paneer, Vegetable Kolapuri, Bhindi Kaghi – vegetarians are spoilt for choice at Chaulas. 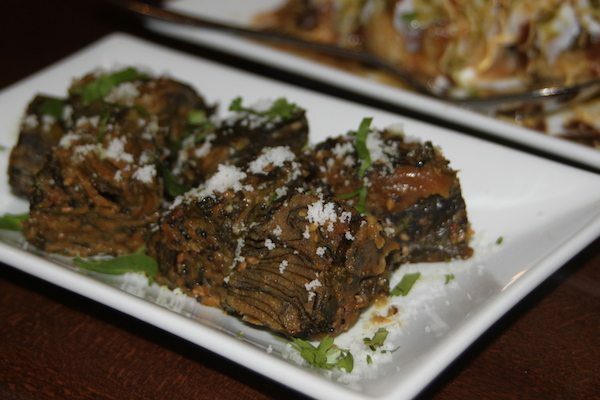 I finally decide on a traditional Gujarati dish, Stuffed Baby Aubergine – succulent aubergines stuffed with peanuts, sesame seeds, jaggery (Molasses) garlic and spices. We opt to share a Pilau Rice (£3.25) and decline the offer of a naan on the basis we ordered three starters. These special curries – and the rice – come served in copper coloured bowls, which in my view hold the perfect amount. Both sauces are distinct from each other, although similar in colour. My sauce is sweeter, my partner’s buttery and rich. All the spices complementing each other and all playing a vital role in the finished product. My aubergine holds the flavour of garlic and nuts and melts in the mouth. My partner’s succulent pieces of chicken team up wonderfully with the thick indulgent Makhani sauce. These dishes are simply delicious. Dessert as always seems like the impossible task. But dedicated to the end, and with complete trust in Yadab, we order Ras Malai (£2.99) – balls of milk solids, steam cooked, soaked in saffron and cardamom flavoured boiled milk. We literally have no idea what to expect from this dessert, but there is no chance we would be playing it safe. I love nothing more than to try something new, especially when I know it is authentic. The Ras Malai does not disappoint us. Like nothing we have tried before, a sweet, spiced and creamy creation; little cardamom and saffron infused cakes drenched in milk, spongy and dense. We loved it! It is clear this food is made with love. Every dish considered, every ingredient important, every flavour authentic. 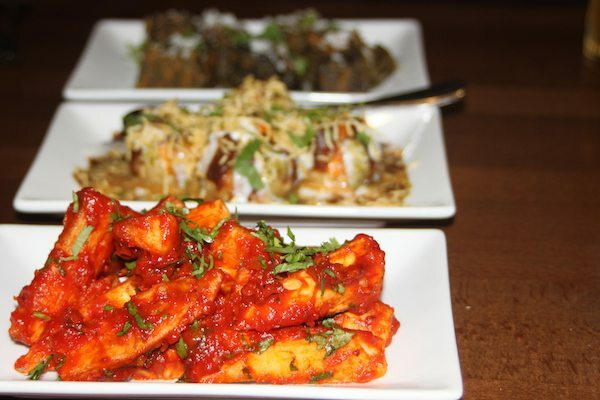 Chaulas promises ‘the food of India, not just Indian food’. After eating there, I am confident you will know the difference. I can’t wait to return!